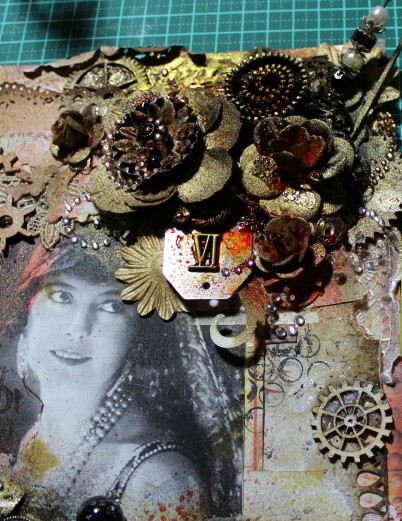 On Thursday I again did classes with Finnabair and loved loved loved it. The Darwin classes were the first on Finn's amazing art tour thru Australia and New Zealand that were organized by Rae Cooper who lives in Darwin and runs the on line shop Scrapmatrix. After doing two days of classes last year with Finn and being influenced by "The Finn Effect" since I wasn't going to miss this years classes!. Poor Ania had just got in that morning from a 26hr flight from Poland but even though she was tired she did an amazing job. None of us were disappointed. I think Finn was guiding us to a less is more effect but I got carried away. I'm quite shy and hate photos of me so I used a lovely dreamy vintage lady from my stash. We played with Finn's metallic coloured paper flowers, metal tags, metal numbers, zipper flowers, metal flowers, long brads(to make custom flowers!! ), cogs, watch faces etc YUM!! Breaking for lunch came way too soon (you just want to keep playing rather then eat LOL) and before we knew it we were making journal covers with lovely textured layers made using stencils and gel medium, Finn's epoxy clear pebbles and more of Finn's mechanical line of goodies. The class was fast coming to an end but part of the process was spraying with shimmery mists on all the embellishments that were stuck on and then doing a final layer of Luminarte Silks acrylics. These are drop deep gorgeous highly pigmented colours with the same colour line/names as Twinkling H2O's and Primary Elements Polished Pigments. I had coveted these and added them to my wish list as soon as they were released so was so excited to get to see and use them at last. It has an amazing glimmer and shimmer that doesn't show in photos but you just want to run your fingers all over it LOL. Now its all dry all I need to do is cut holes were the binding goes (the holes were pre cut on the journal board but covered up with card stock) and then reattach the pages and binding again and its all done. To any of you yet to do Finn's classes you will ENJOY them so much. Thank you again Rae, Finn and all Rae's helpers. Oh by the way Finn loves Steam Punk stuff and I gifted her with one of my Steam Punk puffy heart necklaces...well Rae did it after I went home cause I got too nervous to do it myself!!! I hear she loved it which is totally awesome. 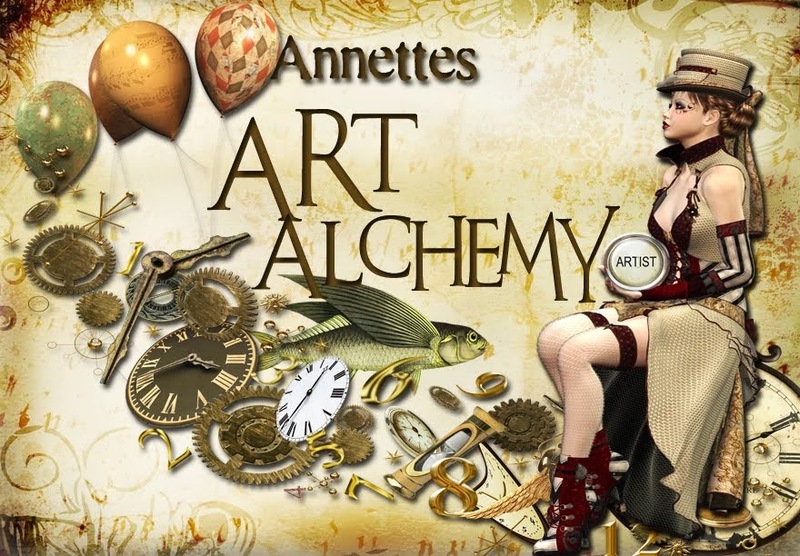 Wow Annette, I totally love both the projects you created. The 'wall hanging' looks amazing, there is just so much texture and detail. I really like the look of the journal cover too. Both look great and i cant wait now till i take one of her classes in Brisbane soon. Ah lucky lady, I would love to have gone myself but not close enough to me :O( Your projects look amazing! What a treat to see all this up close. I recently discovered Silks and bought a few and am IN LOVE. Not only are the colors beautiful, but it feels so smooth and luxurious. A few weeks ago (well probably like a month ago the way time evaporates) you offered to clue me into the spraying process, but I couldn't get your email to work. Would you mind responding to me at: sjansenak@hotmail.com if the offer is still open. I tried one and was really unhappy with the result...Thanks Annette.